The other day the little-ist Baker went for a walk to the park whilst I stayed home to keep an eye on the workmen who were fixing a window. It was the first time I was kinda alone in the house since she was born so I felt a little excited and decided that I was going to try and make something that I had wanted to do since I was a kid… make fudge! When I was about 13 years old I found a recipe to make fudge in a magazine. It looked so easy to do and I had visions of an endless supply of fudge I could make myself. Sadly, it didn’t work so all I got was a large bowl of melted, sticky sugar. I was heartbroken and until a few days ago I never tried to make it again. I knew where it had gone wrong, it was because I had no sugar thermometer to get it to the magic 114c, aka Soft Ball Stage. I tried dropping the bit into a glass of water but it wasn’t accurate enough to get it to work. This time I was armed, sugar thermometer clipped to the side of my pan… I was ready. 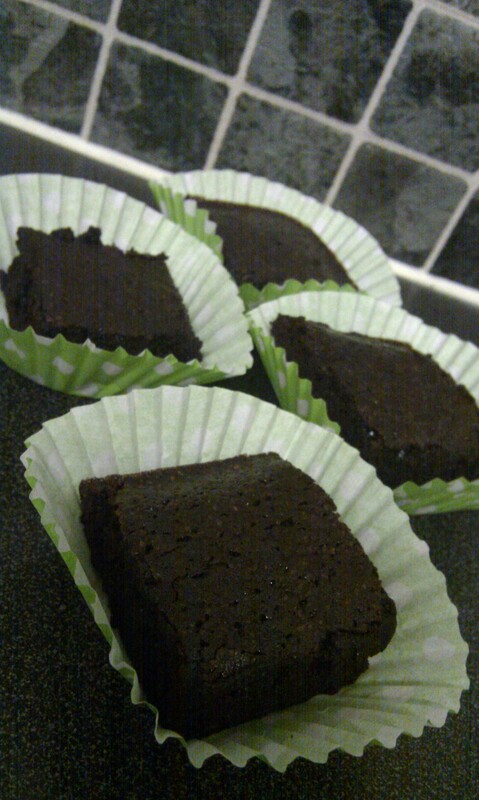 And low and behold – I made chocolate fudge. Not just a little chocolate fudge, a lot of chocolate fudge. 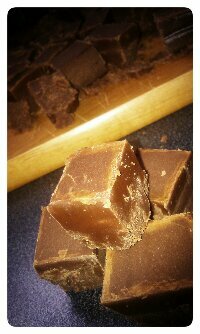 In fact, I made enough fudge for a small chocolate fudge mountain in my kitchen. If I wasn’t on a diet it would have been heaven but instead it called me to eat it knowing I had to be a little bit good that week. I decided to bag it up into little individual bags and gave it away to family. I might have a go at doing this again at Christmas as it would make a lovely little present to give to everyone. The recipe I used was from the Home Made Sweet Shop book which I’d recommend to anyone with a love of old fashioned sweet and a burning desire to make them yourself. Don’t forget to keep any crumbly bits that break off when cutting. I used these to put into vanilla cupcakes. My husband has a completely different taste in puddings and sweet food to me, so when he asked for me to make him some black treacle flapjack I was both interested and a little bit disgusted. To me black treacle is one of them things I keep in the kitchen cupboard for the sole purpose of making my christmas cake; it has always had that unappealing black, sticky look which really doesnt scream “eat me”. For him, he says that black treacle tastes nice. As flapjack is also one of his other favourite snacks it must have seemed a good idea to combine them. So I went ahead and read a little bit more into black treacle flapjack and found out that it was originally created in the 1920’s by the women’s instititute, so is something of a classic recipe. My recipe I created may not be 100% classic but is easy to make, requires little ingredients and gives you a nice chewy flapjack. I have to say that the flapjacks obviously do taste very strong of bitter black treacle, which gives it strange almost liquorice taste so isn’t recommended for someone with a sweet tooth. If you are like me and prefer your flapjack very sweet then substitute the treacle for golden syrup and it will still work perfectly. 1. In a large pan melt the butter, sugar and black treacle together. 2. Take the pan off the heat and stir in the porridge oats until all of the mixture has coated them. 5. Spread onto a small/medium baking try with sides and pat down until nice and squashed in. I think my flapjack were about 2″ thick. 6. Bake in the oven for 8 minutes. 7. Remove from the oven, and score with a palate knife. I cut mine into 8 generous peices. 8. Leave till completely cool before attempting to get it out of the tray. I love flapjack and so does my husband. We recently bought a couple of pieces of chocolate flapjack from a stall selling home made cakes and it was really good. Somewhere in my distant memory is eating chocolate flapjack that tasted just like it, I think it might have been when I was at school but I can’t really place my finger on it. All I know is that it was lovely. So after my last flapjack which went wrong (well, didn’t exactly go wrong but wasn’t chewy – see my Blog Post) I decided to try again. This time I bought my usual bargain porridge oats (I use Asda smart price ones if you want to try them exactly) which I think may have been a problem last time, added a bit more golden syrup and emptied whatever I had left of my box of cocoa powder into the mix… then Ta-Dah, it worked! I didn’t add any chocolate chips to this though I am sure it would be extra lovely with some in, or maybe some fine nuts like pecan or hazelnut? Be warned that this recipe does make a huge tray of flapjack, in fact, more than the two of us could really get through in a week, though it hasn’t stopped us trying. It does keep in a sealed container in a cool place for at least 5 days, which is how long my has lasted so far with no ill effects. 1. In a large pan melt the butter, sugar and golden syrup together. I know I have said before but make sure you sit the metal tablespoon in a cup of boiling hot water, this will help it slide off easier. 2. Once melted add the cocoa powder. I have said 2 table spoons of cocoa powder but this is a guess as I emptied whatever I had left into the mix, if you think it needs more then add a bit more. It should be a lovely dark brown colour. 3. Stir the mixture until all of the cocoa powder has mixed in and has no lumps at all. 4. Stir in the porridge oats until all of the mixture has coated them. 5. Spread onto a large baking try with sides and pat down until nice and squashed in. 6. Bake in the oven for 15 minutes. 7. Remove from the oven, cover with a clean tea towel or kitchen roll. 8. Allow the flapjack to cool for 10-15 minutes then score with a knife into the size portions you would like. 9. Leave till completely cool before attempting to get it out of the tray. I especially love the ones that are all sticky in the middle and have a slight crunch on the top, I think these are usually called American Brownies but the recipe I made at the weekend was from an Australian, and it works brilliantly. When we went on holiday to Australia last year (oh where is the time going?!) for my birthday my Auntie and Uncle gave me a cookbook from an Australian Chef called Donna Hay. As you probably already know that I love cookbooks so I was really chuffed with it. It looked so easy to make so I had a go and was so impressed with the results. Strangely, these brownies don’t actually have any chocolate in at all, yet you would never tell as they taste so chocolatey (I don’t even know if that is a word). If you ever need a simple easy recipe that is so easy to throw together, but that looks and tastes impressive then I would recommend it. Last night I made some dark chocolate and amaretto flapjack for my husband… but this time I was disappointed with it! I have made it so often and never had a problem with it before so I don’t know if it is because I used a different brand of porridge oats or because I cooked it in the oven for 3 minutes longer but they weren’t the nice chewy flapjack they usually are… I made crunchy flapjack. I think there has long been a debate over people who like their flapjack crunchy and those who like it chewy but in our household it is chewy which always win. The difference usually between chewy and crunchy is in the amount of butter or syrup that is put into it and the length of cooking time, so the flavour is always the same; it is just the texture which changed. Flapjack is so easy to make but it is difficult to get it absolutely perfect every time. Usually I use the cheapest porridge oats I can buy from our supermarket (I don’t know why but I have always found that these work the best), margarine, brown sugar and golden syrup. It does have the advantage of making them very cheap to make as well as easy. Unfortunately this time I had to use the premium brand oats as they had sold out of my cheap ones. So this is the recipe which makes a crunchy flapjack. Next time I will try it again with my usual oats and another tablespoon of syrup to make them chewy… and I would also add a bit more amaretto. In a large pan gently melt the margarine, brown sugar and golden syrup till it combines together into a nice dark mixture with no sugar crystals left. You don’t need to get this too hot, just hot enough to melt everything. Then add the amaretto liquor. Take it off the heat and mix in the porridge oats. Whilst the mix is cooling a little take a 100g bar of dark chocolate and use a large knife to cut 80g into chunks. I say to use a 100g bar because then it leave a few squares of chocolate to eat yourself afterwards. You can use dark chocolate chips if you want instead. Mix these quickly into the flapjack and then put it all into a smallish rectangle baking tray. Pat it down firmly with your hands making sure it is all pressed to the edges. Bake in the oven for 28-30 minutes until brown all over. Once it comes out of the oven and is still warm, use a palate knife to cut the mixture into squares. Cover with a piece of kitchen roll or a tea towel and leave it in the tray for 3-4 hours or overnight till it has cooled. 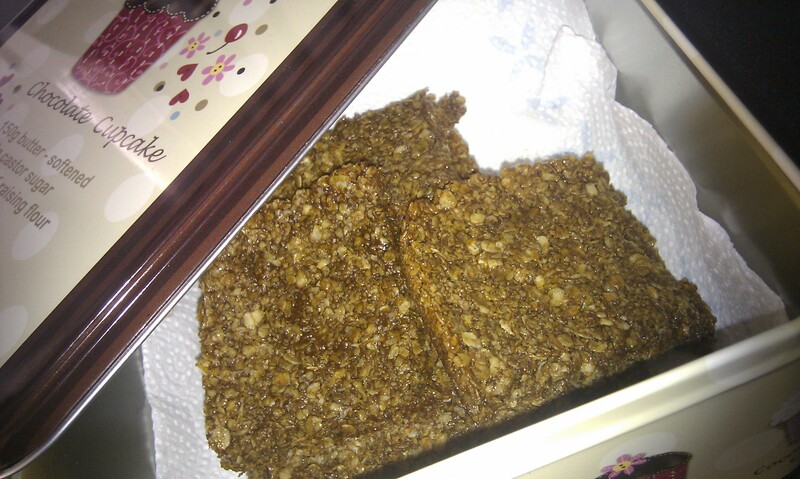 Then you can store the flapjack in an airtight container till it has all been eaten.